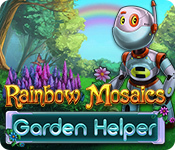 Rainbow Mosaics: Garden Helper is rated 4.8 out of 5 by 10. Rated 5 out of 5 by mcnam9 from Relaxing, beautiful Best Rainbow yet. Gorgeous colors, challenging, perfect music and cute story. Relaxing and puzzles actually look great and recognizable. Rated 5 out of 5 by arnold1049 from DON'T NEED TO BE PERFECT The best thing I found about this game is that it allows you to make ONE mistake without losing a star. That is wonderful, as sometimes my hand jerks and marks something I did not intend to do. This is a great series; colorful graphics, interesting pictures, challenging play. I have all the games and this one is the best so far. 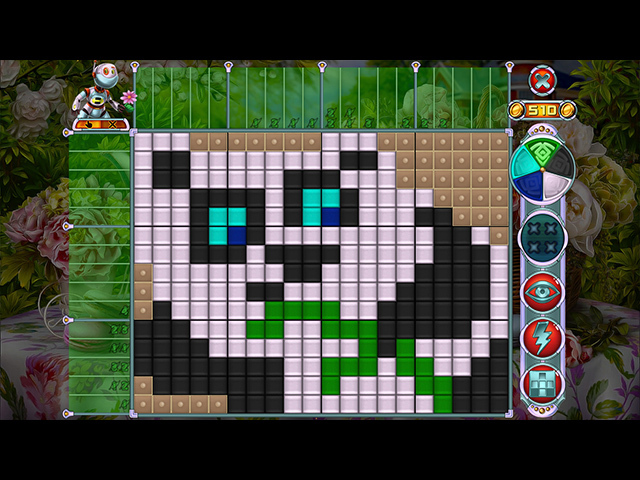 Rated 5 out of 5 by creolo from Rainbow Mosaics: Garden Helper Looks like this is the best game in the series. Riddles are challenging enough and this robot makes me laugh! 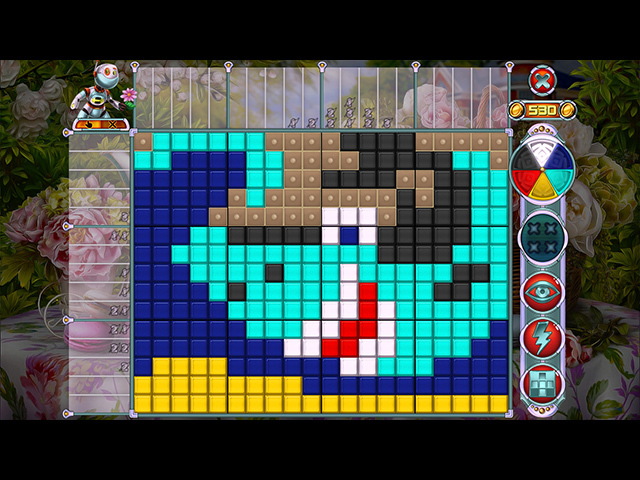 Rated 5 out of 5 by MrsBen from RAINBOW MOSAICS JUST BECAME MY MOST FAVORITE MOSAICS GAME!! Rainbow Mosaics: Garden Helper has my 2 of my favorite things: beautiful tiles and the ability to create something. In this case, your score adds up until you can acquire things like a tree or a pond or many other things to make your garden more beautiful. Then, there are the beautiful tiles which make it sooo easy to differentiate between colors. My favorites are the one that looks like it has stitching around it and the one with the diamond shape in it. But they are all beautifully bright and a joy to work with. Keep them coming, Devs and make the BFG pond ripple with the joy of all us fish, old or young!! Rated 5 out of 5 by verimeri from great game This is an excellent mosaic game. I am near halfway through. So far I have been able to use logic except for a couple times when I used the power-ups. Hey, that's why they are there. I use them if I need them sometimes just to clarify things for me. The little robot with the slightly misfiring brain is pretty funny. Getting to use your coins to build a garden is great fun. Rated 5 out of 5 by biscuitsmama from IT’S ALWAYS A GREAT DAY WHEN I SEE A RAINBOW MOSAICS GAME Rainbow Mosaics: Garden Helper is the ninth game in the Rainbow Mosaic series and it proves how many of us love this type of puzzle game. Personally, I can never get enough of the Rainbow Mosaics, or its cousins the little penguins fantasy game. Whenever I open my browser and see a great game like Rainbow Mosaics it is a “must have” for me and I am a happy camper. Others will go into all of the details so I am only going to tell you that all of the puzzles are terrific. Another reviewer pointed out a feature that I love in these games and it is that each picture is labeled so I don’t need to try to figure out what it is. I too enjoy the variety of tile styles offered and for me the favorite style is the glossy roundish one. However, no matter which type of tile I select each puzzle is entertaining to solve. If you are new to solving this type of puzzle, the in-game tutorial is there to guide you as you begin. 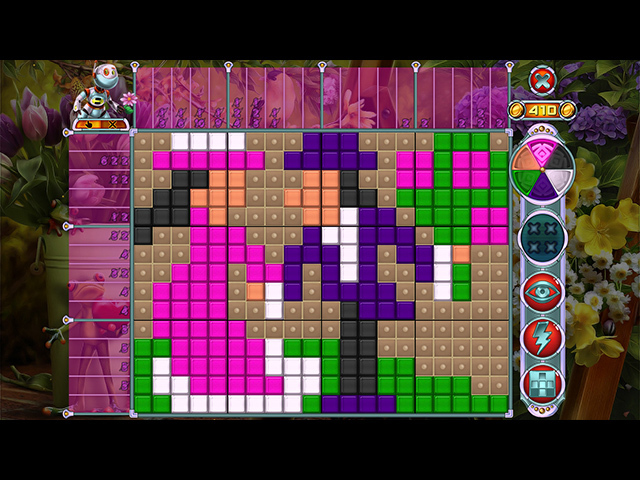 You might find that you happen to love the nanogram or mosaic type puzzle games. As always, please try the demo. Happy gaming! Rated 4 out of 5 by phatkhat from A little disappointed I dislike the transition from real, adult people/kids/pets in the earlier editions to the silly cartoonish robots in this one. Meh. The game is still good and challenging - well, more than the penguins, anyway. The overall quality is good - what is expected from this series. I also am finding that even with the "system" cursor, it is clunky and slow. Not sure I will buy this one because of that. Wish they would give us the real system cursor - i.e. the little arrow - instead of a mini version of the game cursor. Rated 4 out of 5 by dgeehring from Bought it I enjoyed this game - 120 levels of reasonably challenging play and the levels get progressively a bit more difficult. They offer bonuses but if you are careful you really don't need them because all the puzzles can be solved with logic with very few exceptions. I think I only had 2 levels that I needed a "hint". I just turned off the sound because I find it annoying but I always play my games without music. Some may like it. The storyline is pretty silly/stupid but it doesn't play into the game that much so no big deal.